Hi ladies! 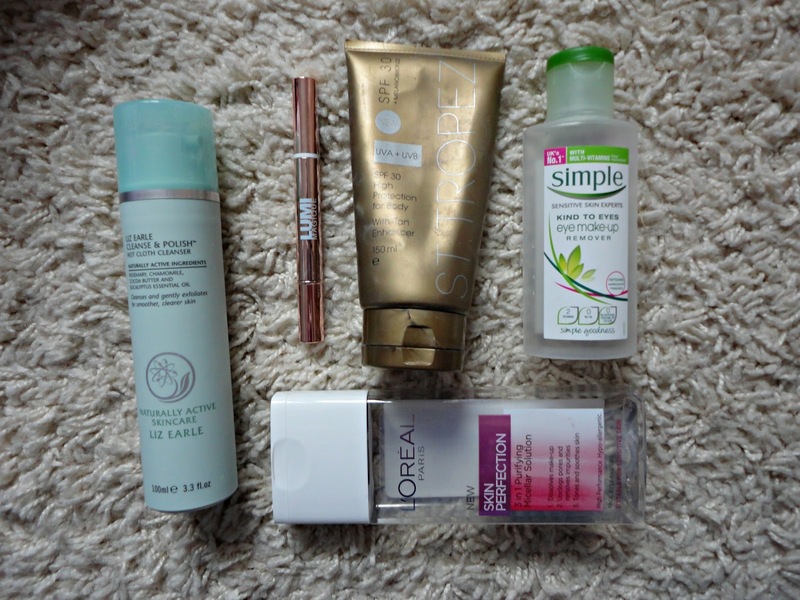 Today I'm doing my June favourites and this is my sixth Empties post! I haven't had that many empties this month as I've been trying out new things this month so just 5 products to mention and talk about. Liz Earle Cleanse & Polish, £14.75 - As I have mentioned plenty of times before, this is by far my favourite cleanser. Although I don't use this on it's own to remove my makeup (see below for what else I use), this does a great job of clearing my skin, leaving it completely fresh and clean. I also love the luxury of using the hot cloth, it's the best feeling after a long day! I already have a new one of this as a gift and I can't see me changing to anything else any time soon. L'Oreal Skin Perfection Micellar Solution, £3.33 - This is the cleansing/micellar water I use to remove all my face makeup before properly cleansing. I tried this out after reading plenty of good reviews online and because it's much cheaper (and easier to get) than Bioderma! L'Oreal Lumi Magique Highlighting Pen, £8.49 - I loved this! It's basically a dupe for the YSL Touche Eclat (although there's a much smaller shade range). I found it didn't last as long as my Touche Eclat (around 2 months using it pretty much everyday) but once I finish my Wake Me Up concealer, I might repurchase this! St Tropez SPF 30 Tan Enhancer, £20 - I only really finished this off on the few days of sun we had last month, as I mostly used this on holiday last year. I do really like the texture of this though, although I'm not 100% sold on the 'tan enhancing' properties. But SPF is so important and this is as good as any! I'm sure using this with the St Tropez Gradual Tan would give a really nice effect too. Simple Kind To Eyes Makeup Remover, £3.39 - I finished yet another bottle of my Simple Eye Makeup Remover. I do think it's a really good eye makeup remover for the majority of eye makeup that I own, however, it does not compete well with Benefit's They're Real. Seriously, what eye makeup remover does though?! So, I decided to switch around a bit and try out the L'Oreal Eye Makeup Remover to see how well that does instead.